Did you ever have one of those weekends that you just don't want to craft? I was sooooo not in the crafting mood this weekend. I tried, but nope...Then today I'm at work and alls I can think about was hitting my craft room. Might be the rain? I also discovered I had this Lawn Fawn stamp set for a while now that I didn't use...gasp!!! I loved the umbrella so to make it pop off the card more I added some faux stitching and glossy accents. I think I'm going to work on a little Project Life now. I'm staying pretty up to date and trying not to fall behind to much. I'm afraid if I do I'll get discouraged and never complete my album. LOVE this card!! The colors are very pretty. 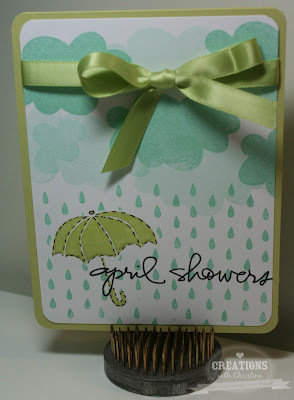 Love the raindrops and the ribbon. Well I would think that an April Showers card would be all gloomy looking but yours is bright and cheery. Very cute. 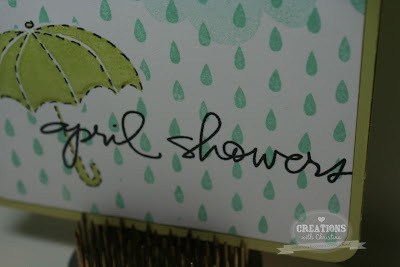 Love the card especially the clouds and the rain drops.